As the only 16th century warship in the world to be recovered from the seabed after nearly 500 years, the remains of the ship together with her 19,000 artefacts including long bows and arrows, clothing, jewellery, musical instruments, medical equipment, domestic items of tableware, as well as ship’s gear such as rigging blocks, navigation equipment, ship’s bell etc, forms a unique and immediately stunning record of maritime life and times in Tudor England. Her history touches on the social, economic and religious circumstances of ordinary people, to create an experience which has been said is akin to stepping into a Holbein painting. The recovery of MARY ROSE and her artefacts was the largest underwater excavation ever undertaken. Subsequently, while the hull has undergone a permanent process of conservation and stabilisation employing the most advanced scientific methods and processes, the project has acquired world-wide renown for its path-breaking contributions to the development and progress of maritime archaeology and academic scholarship in the new science of conservation in wood, iron and leather, etc. Having started his reign ambitiously with the creation of MARY ROSE, there has been a tendency to credit Henry VIII with an instinctive appreciation of the importance to the state of a formidable navy. But even if he was not a naval visionary, he was nevertheless the first monarch to give it a combatant emphasis and it is now generally accepted that he probably did most to create the first English fighting fleet and the administration, and the beginnings of the logistical structure to support it. 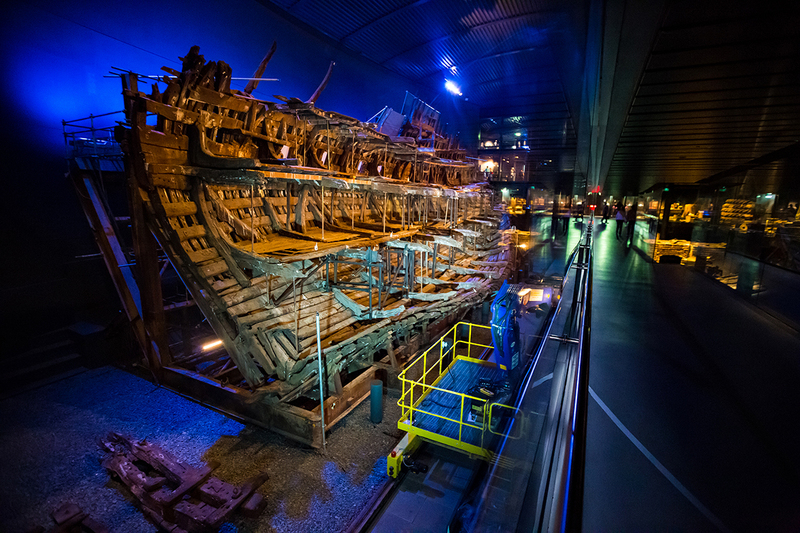 It is through this important association that the MARY ROSE can claim to have significance beyond even her profound intrinsic interest as an artefact, the only recovered 16th century warship. 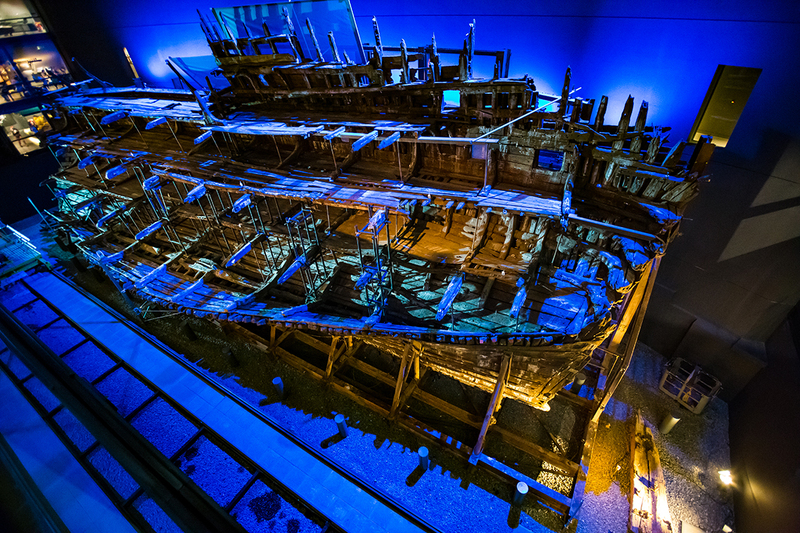 MARY ROSE was a large vessel for her time. Among other things she demonstrates that English shipwrights of this period were able to build vessels on this scale, and to do so on the skeleton form of construction. Her carvel build suggests that clinker building was obsolete - at least for great state warships. But in other important ways she marks a key stage in the transition between the use of a vessel merely capable of supporting guns and one expressly built to carry large guns close to the water-line, thereby making her a critically important vessel to study in order to understand the evolution of the fighting ship. MARY ROSE enjoys a revolutionary status as a vessel expressly designed, or certainly following her rebuilding and refitting in 1527 and 1536, extensively adapted for warfare, for a key development in this context was the invention of the hinged gun port, which permitted the introduction of the continuous gun deck and the firing of broadsides. Ships of war in this era evolved from something resembling floating castles fighting land battles at sea to become mobile citadels of fire power, platforms for heavy cannon, and the MARY ROSE as rebuilt in 1536 was an early and prime example of this new breed of ship, with a complete line of gun ports. MARY ROSE was carvel-built with twenty heavy and sixty light guns comprising a mixture of muzzle-loading cast bronze and breech-loading cast iron guns. 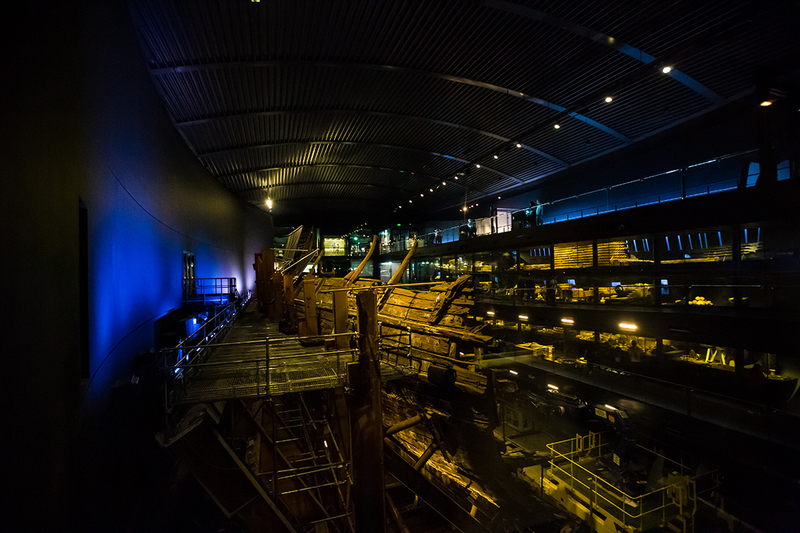 With a complement of some 500 men, MARY ROSE was built for Henry VIII and named for his sister, Mary. 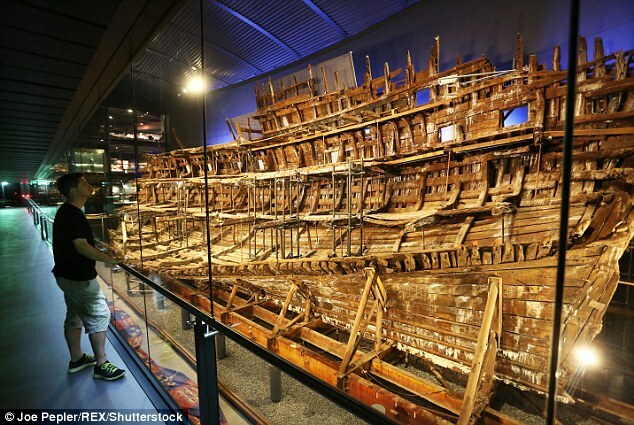 The first of her name in the British fleet, MARY ROSE took part in Henry’s first (1512-1514) and second French Wars (1522-1525), always as the flagship of the Lord High Admiral - his favourite warship. Her tonnage changed from some 600 tons in 1512 to 700 tons at the time of her sinking. The portion of the ship that was recovered is estimated to be equal to some 280 tons. The ship appears to have had a hold and four principal decks, the orlop, the main, the upper and the forecastle, although the latter might have had more than one deck. The keel is constructed from three pieces of elm, scarfed together and bolted to the oak keelson, also in three sections and which sits on top of the floor timbers, with the main mast step acting as the central sector. Just aft of the mast step, by the keelson, there is a circular hole to make room for the lower end of the pump. 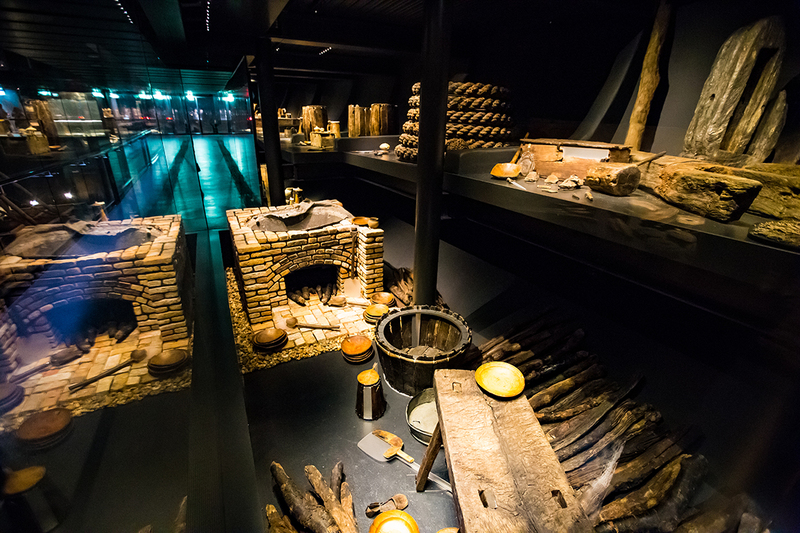 The majority of the frames do not appear to be attached to the floor timbers or to each other but are held in place by the longitudinal stringers, and the outer planking of the hull, in oak, is fastened through the frames, stringers and ceiling planking by hand-cut wooden treenails, which have been hammered into pre-drilled holes and might be up to a metre in length. The ship underwent two major refits, the first in Portsmouth in 1527-28 which required the construction of a new dock, and a later one in about 1536, when it is assumed her burden was increased to 700 tons. The ship was to some extent re-built at this time, to give her a complete lower deck of guns with hinged ports, almost the first British warship to be so equipped. A considerable degree of extra strengthening was added to the vessel and the evidence from dendrochronology strongly suggests that several riders, transom knees, and diagonal and vertical braces were inserted during these two refits, presumably to support new and heavier guns. In 1544-45, MARY ROSE was active in Henry’s third French war. When leading the advance against a much larger French invasion fleet off Portsmouth on 19 July 1545, possibly arising from a simple ship-handling miscalculation, she appears to have been caught by a flaw of wind. Late in the day she tried to tack and was swamped through her lower deck gun ports, sinking in some forty feet of water in a very short space of time with the loss of virtually her whole ship’s company of nearly 500 men. In the succeeding weeks, efforts were directed to raise the vessel but these proved fruitless. It was 437 years before she was brought to the surface, although in 1836 divers John and Charles Dean found the site and recovered a bronze cannon. In the late 1960s, using modern side-scan sonar and other advanced technologies capable of penetrating the deep silt, the ship was formally identified and steps taken to excavate the site. Trial excavations between 1971 and 1978 showed that the ship was lying on her starboard side in the soft upper sediment at an angle of some 60 degrees. Whilst the originally exposed port side had been extensively eroded by marine organisms and mechanical degradation, the hard grey clay covering the site had effectively sealed the surviving starboard portion and protected it from further erosion. In the years between 1979 and 1982, the site was fully excavated, surveyed and recorded. Over 19,000 artefacts were recovered and the remains of the ship were prepared for recovery, which took place on 11 October 1982. The hull has since undergone a process of conservation and stabilisation, employing the most advanced scientific methods and processes. As time has passed, timbers recovered from the seabed have also been conserved and where possible reinstated. In 2003-2004, further excavations of the site were undertaken using the most modern technologies and, in 2005, a 5 metre long section of the original stem was brought ashore, together with several timbers, smaller artefacts and a 7 metre long anchor. The site was then sealed with a membrane and 100 tons of sand, to be made safe and secure for future generations. Source; Campbell McMurray, Advisory Committee, March 2009.